Clinical audit is now an established part of the NHS landscape and a key component of the wider clinical governance framework. In recent times there has been a move away from “optional” clinical audit activity to a more “obligatory” approach. A good early example of this occurred in 2005 when clinical audit became a contractual obligation for all Community Pharmacists. Indeed, all healthcare professionals are now expected to participate in clinical audit work and clinical audit is embedded in medical revalidation with nurses also expected to use audit to show their appraisers that they keep up-to-date and reflect on the work they carry out. It is fair to say that clinical audit has always had a ‘mixed’ reputation and national documents endorsed by the Chief Medical Officer – Good Doctors, Safer Patients (2006) and the Assurance and Safety White Paper (2007) concluded that clinical audit was falling short of its potential and thus needed to be re-invigorated. Since 2008 the Department of Health have made considerable amounts of funding available for the development of audit. There are now many established mandatory National Clinical Audits (NCAs) that Trusts must take part in if their care is relevant to the NCA. The last decade has seen drivers for clinical audit grow at an exponential rate as evidenced by the information included in HQIP’s excellent document Statutory and mandatory requirements in clinical audit available via www.hqip.org.uk. “Clinical audit is a quality improvement process that seeks to improve patient care and outcomes through systematic review of care against explicit criteria and the implementation of change. Aspects of the structure, process and outcome of care are selected and systematically evaluated against explicit criteria. Where indicated changes are implemented at an individual, team, or service level and further monitoring is used to confirm improvement in healthcare delivery”. Although this is an excellent technical definition of clinical audit it is also 68 words long and unlikely to inspire healthcare professionals to take part in clinical audit work. Ironically, the 1989 White Paper Working for Patients provided a far shorter and simpler definition of audit: “audit involves improving the quality of patient care by looking at current practice and modifying it where necessary”. “clinical audit is a way to find out if healthcare is being provided in line with standards and lets care providers and patients know where their service is doing well and where there could be improvements. The aim is to allow quality improvement to take place where it is most helpful and will improve outcomes for patients. Clinical audits can look at care nationwide (national clinical audits) and local clinical audits can also be performed locally in trusts, hospitals or GP practices anywhere healthcare is provided”. 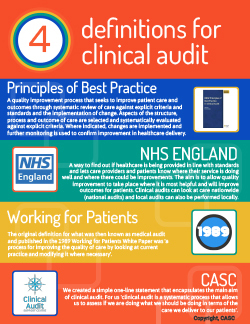 We have supplied this simple infographic which provides details of the key current clinical audit definitions. Click here. Is my project a clinical audit? A common recurring concern that healthcare professionals have is understanding how clinical audit differs from research, service evaluation and other quality improvement techniques. This can be particularly important at a number of levels, for example: a doctor or nurse submitting a clinical audit project to their appraiser needs to be sure that their work is an audit and likewise staff undertaking research incorrectly badged as clinical audit will encounter problems by avoiding the research ethics committee process. To assist with this matter, we have created a number of documents to help. 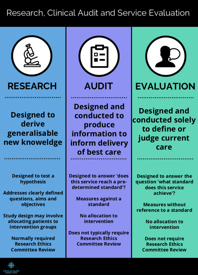 Our ‘Research, Clinical Audit and Service Evaluation’ infographic, click here is based on historical work undertaken by the National Research and Ethics Service and quickly explains the differences between the three disciplines listed. In addition, we have also updated work carried out by the University of Bath to create a simple 4-step guide that helps you understand if a project you are conducting is a clinical audit, click here. Our advice would always be that if you are planning to carry out a clinical audit project then you should contact your local clinical audit team (that may also be known as clinical effectiveness, clinical governance, quality improvement, etc.) as they will be able to offer may provide you with further advice and provide you with support. To complicate matters further, the term “audit” is used in a number of different ways in a healthcare setting. Of course, NHS Trusts and providers must make sure that their finances balance and therefore financial audits will be conducted as standard. These are entirely separate from clinical audit. However, significant event audit (SEA) is an established technique that is used (much like clinical audit) to make improvements and ensure care is safe and effective. We have provided an infographic, click here to help you understand how clinical audit and significant event audit differ. In a nutshell, while clinical audit compares current practice to agreed standards and focuses on a population of patients, significant event audit looks at individual cases of care where a problem has occurred with the objective of understanding what went wrong. Both clinical audit and SEA compare care with best practice but adopt different approaches. Proactive teams should be familiar with both techniques not least as clinical audit and SEA can help inform each other.